Scott Safety has today launched a fire fighting industry first – Scott Sight – an in-mask thermal imaging intelligence system. 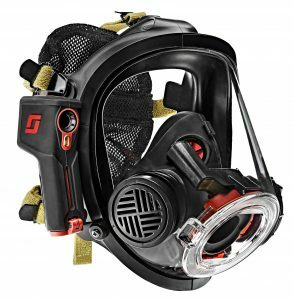 This ground-breaking thermal imaging technology enables integration of a lightweight thermal imaging camera within the mask’s display, providing firefighters with a clear, unobstructed view of their surroundings by keeping a thermal image in view at all times. Although exceptionally lightweight at 240g, Scott Sight is very powerful producing a 160×120 resolution at nine frames per second through an infinity lens, which ensures a clear picture with no eyestrain. An additional benefit of Scott Sight is that it can be configured to suit the individual wearer’s needs. The display can be set to the wearer’s line of sight and various user interfaces are available to suit different tastes. Hot spot and ambient temperature settings can also be selected. Scott Sight is currently compatible with the new AV-3000 EN fire fighting mask from Scott Safety. As world leaders in the design, manufacture and sale of high performance products for the fire and rescue services, Scott Safety remains committed to improving firefighter safety by developing market-leading products.